Fischer, 49, who had been making caramels for years, tweaking an old family recipe, finally began selling them in February 2011 at the urging of friends and family. What finally got the enterprise to become real, she says, was a serendipitous relationship with Deanna Hawkins, owner of Sugar Daddy’s Cakes and Catering. Fischer happened to notice that the bakery closed at 2:30 pm each day, leaving the commercial kitchen unused. “Without Deanna saying yes [to sharing the kitchen], I don’t know how long it would have taken me to get this off the ground,” says Fischer. The two businesses now jointly occupy a store at 5340 S. Old State Road 37. This wasn’t Fischer’s first foray into business. In the 1990s she ran a furniture upholstery operation out of her home’s lower level. After ten years, this self-professed people-person told her husband, “I’ve got to get out of this basement!” She then pursued a career in nursing, and although she loved the work, she found it stressful. Her employer allowed her to continue working part time until the caramel business took off. And take off it did. 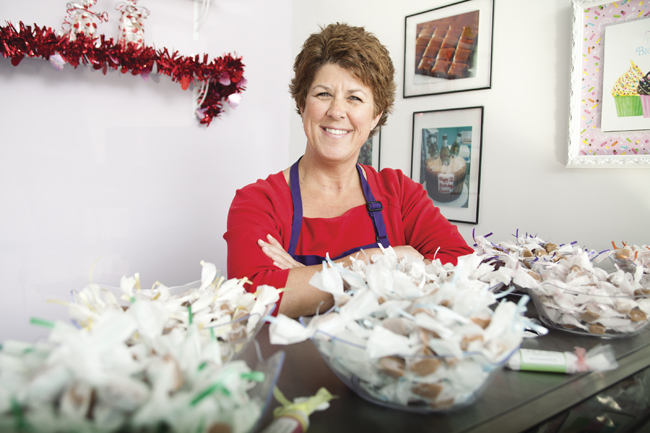 Joan’s Caramels sells not only at the bakery but also on the Internet, where orders come in for weddings, fundraisers, and corporate events. One client, Employment Plus, sends caramels to their employees across the country on their birthdays. Catering with Sugar Daddy’s, the two women are able to provide a full range of candies and baked goods. Fischer describes her caramels as a soft, melt-in-your-mouth confection that won’t stick to your teeth. Her primary flavors are Original Vanilla, Salted, Turtle, Peanut with Sea Salt, Maple Pecan, Caramel Crispies, and Mocha Espresso Sea Salt. She also offers seasonal flavors, such as Eggnog during the Christmas holidays. In addition to the candy, she sells caramel apple dip and caramel brownies. Joan’s Caramels is open weekdays 10 am to 6 pm and Saturdays 8 am to noon. For more information, visit the website or call 320-5638.